Asus, during CES 2015, launched the successor of their ROG Swift monitor upgrading its display to an IPS panel – the Asus ROG Swift PG27AQ 4K IPS gaming monitor. Just like its predecessor, it also features NVIDIA G-Sync but now comes with an IPS Panel for a better, wider viewing angles and incredible accurate color reproduction, plus it has a 3840×2160 UHD resolution. More details below. Asus hasn’t disclosed much information yet regarding the upcoming Asus ROG Swift PG27AQ gaming monitor, but we do know that it’s a 27-inch LED backlit display with an IPS panel. Meaning, it will have a better viewing angle and better color accuracy compared to its predecessor. The Asus ROG Swift PG27AQ features NVIDIA G-Sync technology which provides a better gaming experience by eliminating screen stuttering and tearing displayed by the monitor. Just like its predecessor, the PG27AQ can be tilted, swiveled, pivoted and height can be adjusted. It also has a brightness of 300 cd/m² and a contrast ratio of 1000:1. I was excited about the first ROG Swift, but now I am even more excited about this new Swift PG27AQ. It won’t be long now until we see some official reviews. There is no word yet about pricing or availability as of today. Probably we might see this in stores by Q2 of 2015. – Unfortunately these technologies are not available at 4K/60Hz. 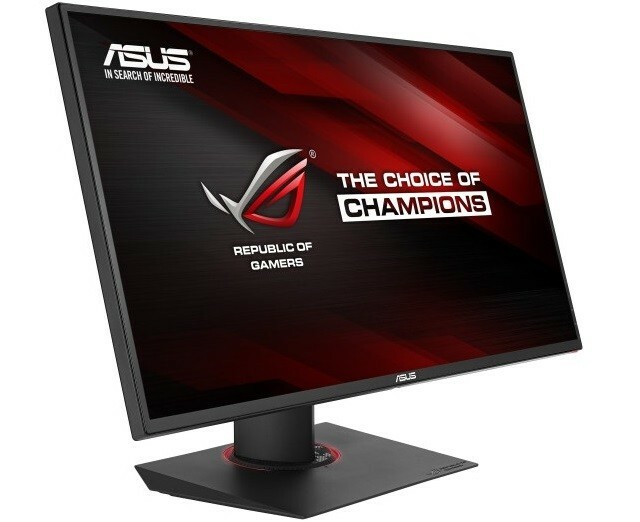 2) Does the Swift PG27AQ support ASUS Eye Care? – Yes, the Swift PG27AQ has flicker-free, low-blue light and anti-glare technologies. 3) Why not 4K @ 144Hz? – Current DisplayPort bandwidth limits 4K resolution to 60Hz only, so, for fans of FPS/shooters, beat ‘em ups and competitive RTS (for example), we still recommend the fast-refresh PG278Q, while gamers who play MMOs, RTS, MOBA, 4X, Sims or action/adventure (again, for example) will likely prefer the greater resolution, and still benefit from G-Sync.